Friends, it is once again a privileged to have the opportunity to address the annual LFI lunch. I would like to thank everyone from LFI for organising today’s lunch, and I am sure you would like to join me in thanking Sir David Garrard and Isaac Kaye for helping make it happen. I am delighted that Ambassador Daniel Taub is with us today and I would also like to take this opportunity as we approach the first anniversary of his induction to say how much I have admired the humanity and generosity of spirit shown in his tenure by Chief Rabbi Mirvis. I am proud to be a supporter of LFI. You play a vital role in promoting Israel and passionately campaigning for a two state solution for two peoples. We are committed to working with LFI to further deepen the relationship between my party and the Israeli Labour Party led by Isaac Herzog, who I was delighted to welcome to my home during his recent visit. I would also like to play tribute to Anne McGuire who has done an excellent job in chairing LFI over the last year. I also want to welcome Adrian Cohen to his new position as chair of LFI and I am sure we all want to show our appreciation for the tireless efforts of Jennifer Gerber who joined us on our recent trip to Israel. Let me say before I get into the main part of my remarks, I am sure all of our thoughts today are with the 3 kidnapped Israeli teenagers, Naftali Frenkel, Gilad Shaar, and Eyal Yifrach and their families. We all profoundly hope for their speedy and safe return. And it is a measure of this community’s concern that on Sunday afternoon the Chief Rabbi led a service attended by over a thousand people to pray for their safe release. Today I want to talk to you about my reflections following my recent trip to Israel. And what it meant to me as a Jew, as a son, a grandson and a father. 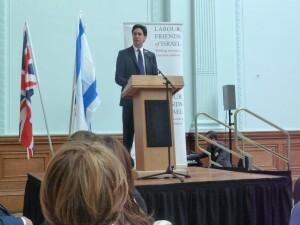 And what it means for Labour in government and our approach to Israel. We travelled out on the El Al flight LY316 three days before Passover. Justine and I had not entirely anticipated something, which I am sure will be more familiar to so many in this room, and Chief Rabbi I am sure in particular to many of your congregants – that every other passenger on the plane seemed to know each other. On our trip we would witness the candour of Israelis and the willingness to speak their minds. I particularly enjoyed the moment at a briefing given by a group of Knesset Parliamentarians, one of whom, in a state of complete exasperation, turned to me and referring to his colleague said, “Mr Miliband, please don’t listen to him he has no idea what he is talking about”. It makes the Parliamentary Labour Party appear positively benign. As we touched down on that pre-Passover plane, it immediately took me back to being a young boy and travelling to Israel for the first time. For the next two days, I would have the most vivid reminders of the deep roots that I have in Israel: like visiting my cousins at the Nachshonim Kibbutz, where I had picked oranges as a child, and having dinner with my extended family in Tel Aviv, arguing and debating, with love and affection. First, being approach by the assistant to the President of the Hebrew University, who said to me: “My grandmother was in hiding in the same Belgian village as your grandmother”. I can truly say to you, that experience would be unlikely to happen to me in any other country in the world. That is just one of the reasons why Israel has special meaning for me and a special place in my heart. Second, my visit to Yad Vashem. A moment of reflection, mourning and discovery. Reflection on the loss of so many millions of Jews. Mourning for so many members of my family that were lost. And discovery. As I left Yad Vashem I was handed a collection of documents about my family including new information, 70 years later, about what happened to my grandfather and where he perished. It was an extraordinary feeling, so many years after he died, to make new discoveries about his death. The new Yad Vashem tells an overwhelming story of the greatest single stain on the conscience of humanity – the Holocaust. Jews before 1939. And of course, it also tells how Israel became a miraculous affirmation of life in the face of death. Finally, I would also say that it was a joy for me to have Justine with me on my trip to Israel. And for her to have a chance to meet my family. She was moved and delighted to be there. And I look forward to travelling to Israel with my children, Daniel and Sam, when they are older. So these are some personal reflections about my trip. But I did not simply go as a Jew returning to his family’s roots, but also as someone who wants to be the next Prime Minister of this country. So I also want to reflect on the lessons I learn as the person wanting to do that job. And my theme, the promise I want to make to you today, is about the priority the next Labour government will attach to its relationship with Israel. Because of its importance to the Jews of Britain, because of the democracy it represents, because of its economic lessons, and because of the importance of a Middle East peace process for the stability of the world. I specifically chose this as one of my first official overseas visits because of all these reasons and more. The priority that I attach to our relationship with Israel, is not just a promise for Opposition, but a commitment for government. And today I want to tell you where that sense of priority leads me on the major issues that matter. As LFI has repeatedly argued, the world needs to get to know Israel better for its economic achievements, as well as its security and diplomatic challenges. And what struck me is that while Israel is an amazing economic powerhouse, it also faces the common challenges of inequality that so many countries around the world are wrestling with. The Israel I experienced on my trip was one that is seizing the future: like the young people at Hebrew University and the thrilling innovation and entrepreneurship of new and high tech businesses. Israel is a major world innovator and I was inspired by the work of the high tech hub, organised by the British Embassy. We learnt some of the interesting lessons about Israel’s success: the rate of graduate entry, immigration bringing new skills, the availability of venture capital and the collaboration between private and public enterprise. I want to take this opportunity to pay tribute to the excellent work of our brilliant Ambassador Matthew Gould. And I can tell you that a major priority for a Labour Government would be to further collaborate, building stronger working relationships between British and Israeli companies. And yet for all the innovation, and economic success, it is impossible to ignore the security challenges that Israel faces. Indeed, they are an economic issue, holding back investment and preventing Israel from achieving even greater things economically and socially. And they are not simply issues for Israel, because we all have an interest in a stable and secure Middle East. Visiting Israel brings home the security challenges that it faces very starkly. We visited Sderot and I saw the rockets that had been fired from Gaza and landed in that town. I heard from the Mayor about the reinforcements against rockets they had to build for their local schools. And Justine and I met children, no older than my own, who don’t get the luxury of playing outside as ours do, but are assigned to an inside bunker playground. And we met the parents of Daniel Viflic, who had been killed in a rocket attack just before Passover in 2011. He had simply been visiting his grandmother. The Viflics are the bravest people, but nothing can change the grief and loss they face. And after 10 years of continuing rocket and mortar attacks on Israeli civilians from Gaza, of course there remains deep concern amongst Israeli citizens about their security. So attaching the right priority to our relationship with Israel means fully understanding its security concerns and the threat to its people. Therefore, we must ensure Israel’s security and right to protect itself. With the unfolding situation in Iraq, we are also reminded of the security situation that Israel faces beyond its borders. Iraq is today facing fundamental threats to its integrity, security and stability. ISIS is a violent and brutal military group posing a threat to the entire region. As we have seen in a horrifying way in the last few days. Their advances in Iraq and their growing base in northern Syria should be seen by all as extremely grave developments. As Douglas Alexander said yesterday the priority now must be to promote the political integrity of Iraq, to help the Iraqi government through support and advice and do everything we can to provide humanitarian assistance. Nobody should be in any doubt about the seriousness of the situation and the priority it demands from the world. Given all of our interests in stability in the region it is right also to be seeking dialogue with other countries in the wider area. I want to be clear about Labour’s position: we are under no illusions about the Iranian regime. It has supplied thousands of missiles to Hamas and Hezbollah which have been used against Israel. If Iran continues its illegal nuclear programme and develops a weapon, it poses a grave threat to Israel and to the stability of the region. That is why the world has such a strong interest in preventing this happening. The interim agreement brokered by Cathy Ashton is a step forward. We should take nothing for granted about Iran’s behaviour but that route represents by far the best hope for avoiding what we all fear: Iran with nuclear weapons. But while it is absolutely right to remain deeply sceptical about the nature of the regime, we support the Government’s decision today to reopen the Embassy as a means of engagement. All of us are conscious, especially at this moment of the instability of this region. Not just in Iraq but also the unfolding tragedy in Syria and the consequences that is having for neighbouring states. For us that reinforces the importance of a successful peace process. Our trip to Israel turned out to be just prior to the collapse of the talks. We can all see the considerable challenges to the peace process. And there is a growing sense as to what those challenges are. Settlement building in the occupied territories is a significant threat to a negotiated agreement. The daily reality of all this was brought home on our visit. We had the chance to visit a Bedouin camp in the Occupied Territories. People there lived difficult, impoverished lives, and are faced with the potential threat of eviction. As we heard during our trip, the real fear is that settlement activity makes the viability of a two state solution more challenging. And those significant challenges to the peace process include the role of Hamas, not just its failure to renounce violence against Israel but to accept its very right to exist. These deep concerns about time running out represents reasons for pessimism. They lead some to say that support for a two-state solution should be abandoned. After all what is the alternative? So we should step up, not abandon, our support for a two state solution. We should do so deeply conscious of the pressure of time. But having set out the reasons for pessimism, there are reasons for optimism too. Most conflicts are unresolved because we do not know what an agreement looks like. What came home to me on this trip was reasonable people on both sides have a sense of what a resolution looks like. Two states for two peoples, based on 1967 lines with mutually agreed land swaps, with Israel as the homeland for the Jewish people and the state of Palestine as the homeland for the Palestinian people, and with each state enjoying self-determination, security and mutual recognition. We know that compromises in key areas must be made on both sides. We must also do nothing that will get in the way of peace. So we are clear that the threat of boycotts of Israel is the wrong response. We do and we will resolutely oppose the isolation of Israel. And my party does so. No one in my party either should question Israel’s right to exist. And what is our role in all this? As friends of Israel. 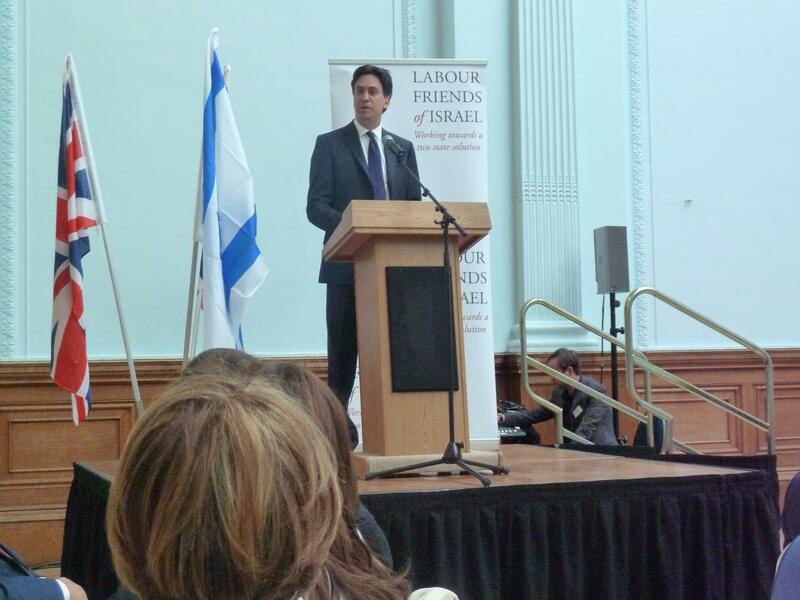 We must, as LFI is, be persuaders for peace and the two state solution. We can’t deliver peace unless both sides in the conflict want it. The international community can set high expectations of both sides. That is what Secretary Kerry has sought to do in an outstanding and brilliant way, winning the trust of both sides. That will be how a future Labour government approaches the peace process, passionate and engaged in a successful outcome. So let me make this pledge today: in that spirit, we stand with Israelis and Palestinians in their pursuit of peace. It was meeting extraordinary Israelis and Palestinians that made my recent trip an extraordinary journey. And a complete privilege for me. committed public servants, people from every walk of Jewish life with deep love and affection for Britain. Over these four years, I have learnt a lot from you. And I hope you have found me willing to listen and learn. I want you to know that if I become Prime Minister in less than a year’s time, I will be proud to do so as a friend of Israel, a Jew and, most of all, someone who feels so proud to be part of the community gathered here today.